What is ISR in non-physical domains? Ask commanders what they want more of, and one of the top responses is more intelligence, surveillance and reconnaissance. ISR has become a critical asset in planning operations and understanding trends within a commander's battlespace. Non-physical domains and maneuver spaces are becoming more prominent in emerging and future conflicts. But how will commanders be able to "see" in cyberspace or the electromagnetic spectrum? "I truly believe that our commanders at each echelon need to have the capability to visualize this [cyber] battle space, this domain," Brig. Gen. Patricia Frost, who leads the Pentagon's new cyber directorate, said in November at the annual CyberCon conference hosted by C4ISRNET and Federal Times. "We give tremendous intelligence, surveillance and reconnaissance to commanders at every echelon. They physically can see aspects of their battlespace. This is a battlespace, a domain they need to be able to visualize as well." Part of this involves greater insight and electromagnetic battle management, or EMBM. The Army is developing tools to help commanders gain a greater understanding of the electromagnetic spectrum. The electronic warfare planning and management tool (EWPMT) will provide an initial integrated electronic warfare system (IEWS) capability by coordinating and synchronizing operations across the the command post, from the joint task force level down to the battalion. The first of four EWPMT capability drops was fielded to Fort Bliss in September. It is "loaded with formulas so [a commander] can say, ‘If I had an adversary system on this hilltop, what would the effective range be based on what we know about the adversary system?’ So he can plot things like that," Col. Jeffery Church, chief of strategy and policy at the Army’s new cyber directorate, told reporters at the Association of Old Crows annual symposium in Washington on Nov. 29. "Or he can do routes. 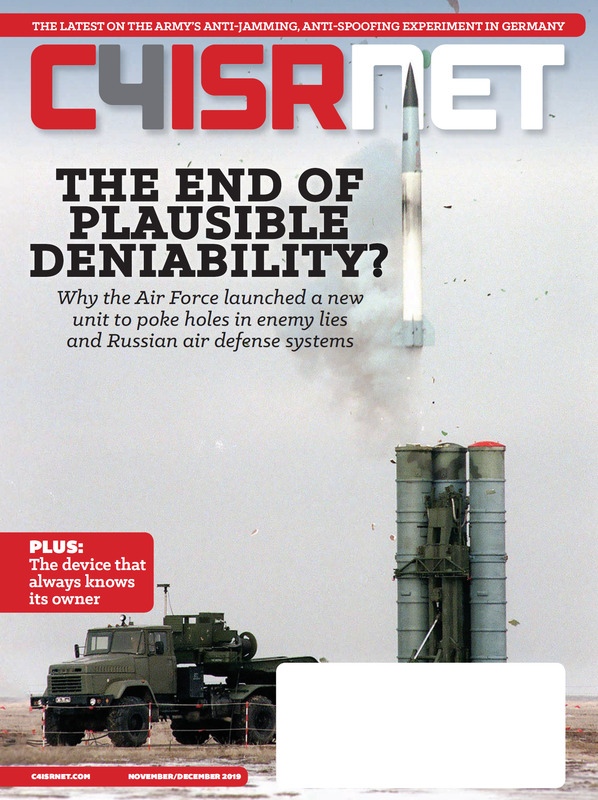 So if you’re going to go from A to B along that route, he can go in and say, ‘OK, I’ve got this kind of radio, I know this is the elevation and terrain I’m at, will I have comms back with my headquarters?’"
In an exclusive briefing from Raytheon, the industry partner for EWPMT, C4ISRNET was afforded a rare opportunity to see what is possible with current capabilities as well as what is to come with further capability drops. As part of the demo, C4ISRNET was shown the web browser graphical user interface, or GUI, that electronic warfare officers (EWO) and commanders can visualize the battlespace. This picture — in capability drop 1, which Church told reporters was "a very basic tool, it is not the end-state that capability drop four will bring," — depicts a variety of items including airborne assets, what they’re jamming (depicted by lines to particular targets or areas on the ground) or areas that might be affected or not from a potential jamming operation. All this is overlaid on real 3-D mapping data of the operating area. EWPMT allows for frequency deconfliction to avoid instances in Afghanistan where jammers were used to interfere with improvised explosive devices, but prevented friendly forces from communicating with each other. Capability drop 1, which allows for a shared vision from battalion to division, is where the all the tools are delivered — for jamming, what is being jammed, what is emitting, what the enemy emitter looks like, what it might look like to plan around the enemy’s emitting, and to plan jamming the enemy to allow for physical maneuver in the terrain, said Niraj Srivastava, senior manager for Raytheon's airborne information operations electronic warfare systems. 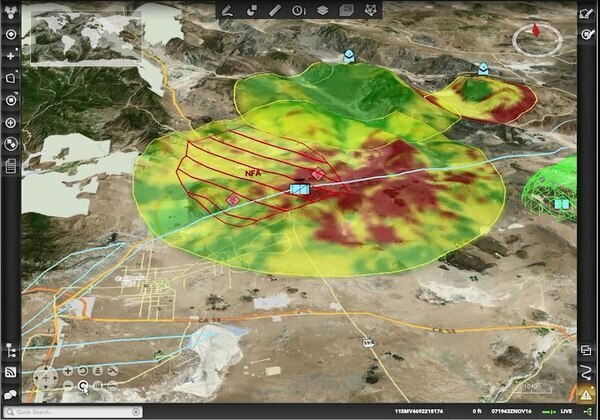 Screen shot of the EWPMT graphical user interface depicts assets in the field and effects of jamming capabilities in a particular area. Capability drop 2 is more spectrum management — not just terrain maneuver, but maneuver through the spectrum space. Capability drops 3 and 4 will begin to look at some of the cyber situational awareness capabilities. This will involve a follow-on to EWPMT Raytheon is working on called Cyber and Electromagnetic Battle Management, or CEMBM. If there is a sensor in the field, not just emitters but digital footprints, these later capability drops will bring them in and enable commanders to display its capability and how to exploit it. A situation could arise in which it might be necessary to take a cyber technique against a cyberthreat — not just jamming — and Raytheon is currently working this for the future. An additional capability in capability drop 3 will be the ability to remotely turn on and manage jammers or electronic assets downrange. Regarding current capabilities, EWPMT provides insight for commanders planning to move their physical force or a convoy through a particular area. If a commander wants to move through a particular path, the tool enables them to see if they are affecting or jamming the bad guys. A green heat map overlaid on the GUI will signify that friendly forces are jamming that particular threat, while a dotted red line means forces are degrading the adversary’s capability, not totally jamming. This is all based on knowledge of emitters that exist in the field that come from intelligence and data that is loaded into the system. If a commander is not confident in the known or unknown emitters that exist on a planned path, the tool allows for mapping of blanket jamming to see the effective range friendly jammers have along said path. From a planning perspective, as EWOs might be setting this up for the commander, they can plan how to move the force based on where they might expect to be jammed. Additionally, when doing the modeling and simulation for a potential operation, the EWPMT interface takes physics into account to calculate the lines of jamming, such as the electromagnetic propagation. EWPMT also provides the commander with a list of options: If they want to jam against a particular threat, it will give them options to protect against the threat. The commander can be given a number of courses of action with options, which tells them what assets are available to for a given action and provides a score of time to mission, the effectiveness of the asset, if there are any conflicts, fratricide — and each individual score item can be ranked depending on the importance level of a given commander. "What we don’t have today that I feel we need to grow in capability, which we’re working on with our electronic warfare planning management tool, is how do you just visualize that for a commander," Frost told a small group of reporters at the AOC symposium. "Because it’s not something that’s tangible. So you want that visualization tool to be in the ops center that says this is a type of energy you’re projecting out — how the enemy would view you — and this is maybe how you can see the energy that’s within that battle space." The Defense Advanced Projects Agency is also working a similar endeavor. The RadioMap project seeks to provide real-time awareness of spectrum use across frequencies, with a goal of mapping an accurate picture of spectrum use in complex environments. Similar to EWPMT, this information can be used to help commanders plan and understand this complex space. This program will ultimately be transitioned to the Marine Corps, with the option period taking place in May, said Mark Tracy, senior program manager at Lockheed Martin. RadioMap uses Raptor-X, which is a software-based geographic information system framework allowing for customizable plugins. While RadioMap used heat maps of the radio frequency (RF) picture and regions where devices might be emitting, similar to EWMPT, Tracy said the feedback from Marines that tested it said it would be more useful to have a waterfall, which was then placed into the system. The waterfall is a box at the bottom of the GUI that provides in a bar graph form the various frequencies that are broadcasting in the spectrum in a given surveyed environment. Used as a planning tool, a commander could see where there is limited spectrum and available spectrum to place resources. They could also track friendly forces or say they don’t know what or where a particular signal is coming from — it could be adversarial. The waterfall demonstrates to commanders the actual maneuver space in spectrum. By clicking on a particular signal on the waterfall, one can dig deeper into what that signal might be. Jason Schuette, DARPA program technical assistant, said the commandant of the Marine Corps, Gen. Robert Neller, wanted to have an RF footprint of the Marines to see how much they emit in battle. RadioMap can help manage that, or allow commanders to be able to tell if a unit is not transmitting. Deputy Secretary Work described at the annual Association of the United States Army conference in October that the "old adage was … if you can be seen you can be hit, and if you can be hit, you can be killed. The new adage is if you emit, you die." "We can get all camouflaged up, we can hide in holes, we can put camouflage nets on, wear ghillie suits, camo up our faces, color our teeth green and you can’t see us at all until I push the button on my radio to talk, to tell my boss, ‘Hey I’m here,’" Church said. "Bam. All that physical camouflage from the eyeball just went away because now you’re broadcasting in the spectrum. So we can show that to commanders and they can start getting an appreciation of how the spectrum is a capability for them and a vulnerability." Commonality between the services has been a big focus recently. According to Brig. Gen. Edward Sauley, deputy director of operations for joint electromagnetic spectrum operations and the mobilization assistant to the director of operations for U.S. Strategic Command, one of three critical gaps within electromagnetic spectrum operations is the need for greater collaboration within EMBM. "The gap, as identified by this joint war fighter, is these programs don’t talk to one another. The services do not go to war — we fight as a joint force under a single command," Sauley saidat AOC, listing the various EMS planning tools the individual services have. The joint force must have EMBM capability at the operational level able to pass real-time, joint-restrictive frequency lists, he said, adding that it's essential for command and control across the service lines. Pietryka, of Raytheon, said the ultimate goal for EWPMT is to be service-agnostic. Raytheon recently announced the successful testing and interoperability of EWPMT with Raptor-X. This now means that the Army can work with or have visibility on Marine Corps jammers given the capability of operating respective management tools on the same baseline. From a cyber perspective, visualizing planning and understanding the cyber terrain, much like the electromagnetic spectrum, comes down to authorities and echelon, Frost said. "When you say ‘cyber,’ we say surveillance and reconnaissance," she said. "So to me — it depends on what echelon you talk about. So if you talk at the tactical edge, you could talk about having a capability that regardless of what type of vehicle or air platform you’re in — how do you map the environment? What types of zeros and ones? What does that environment look like from an IP/RF-based [platform] — who’s operating in that environment?" Frost added that when she first entered the Army there was a library of signals that were used to identify a certain target, but the environment was significantly less complex and crowded. "Today, if you look in a battlespace there’s civilian communications because we’re all using this electromagnetic spectrum and everything. Whether it’s a frequency base or an IP base, what is within that environment that a commander needs to be concerned with," she said. "And that’s where I get in these authorities discussions and I say I would never want to deny a commander the ability to truly see their environment — especially now that we declared it the ‘cyber domain.’ I think they should have some type of capability to see their environment." Cyber intelligence is not cybersecurity, but cyber intelligence analysts must understand offensive and defensive cyber operations to be a successful cyber intelligence analyst," Air National Guard Col. Arthur Wunder of the 102nd Intelligence Wing Office of Transformation, wrote in February. "Every action in cyberspace has a human behind it, whether it's driving a specific switch action or initiating an automated denial of service attack; someone, somewhere is initiating and directing that action. 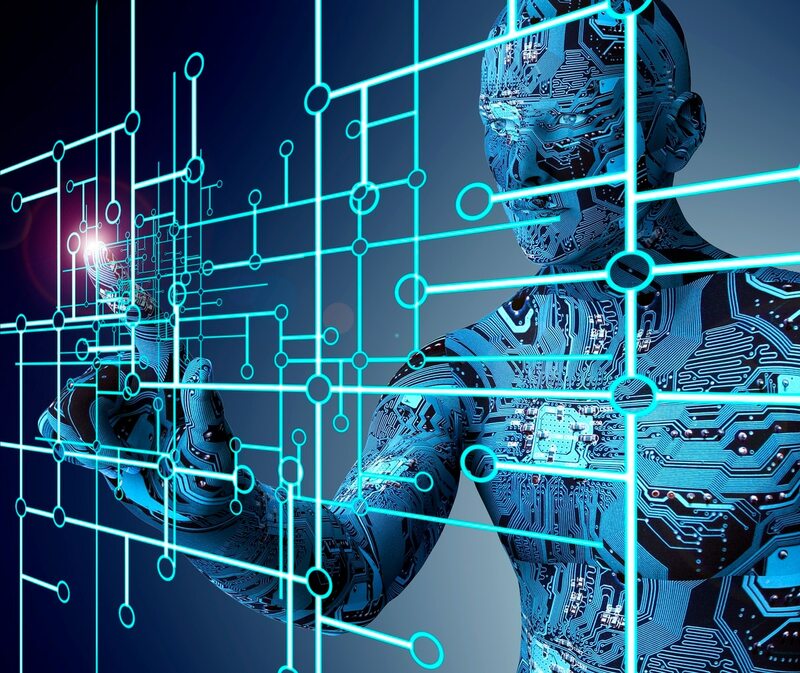 Cyber intelligence involves trying to connect the dots and identify all the different touch points between the various layers in cyberspace. Determining the connections and connection points lets the analyst draw a multidimensional picture of where potential cyber vulnerabilities may exist, or identify the actors behind an action." There will continue to be discussions surrounding authorities in cyber and cyber intelligence, as what traditionally existed in the shadows of intelligence agencies is now becoming a war fighting discipline. "In terms of ISR, we continue to have Title 10 and Title 50 conflicts; is this capability electronic warfare or is it [signals intelligence] under Title 50?" Col. Jeff Aldridge, director of the Joint Electronic Warfare Center at STRATCOM, said at the AOC symposium. "We had similar issues with advanced electronic attack and cyber attack. The key difference is cyber has a persistent effect on software, hardware, etc., while electronic warfare does not have a persistent effect – the effect is done once jamming is terminated." "If we say it’s a ‘cyber’ capability, depending, it has to go [the Defense Secretary] or higher," Frost said. "When we go to the National Training Center, we bring congressional members out, we bring folks from [the Office of the Secretary of Defense] and we say, 'let’s have this discussion' … We’re not saying that we’re going to do something that will cause World War III. We’re saying we want to give capabilities that I truly believe a commander needs to have to see their environment."